Scientists report on the progress of the Phoenix lander exploring the northern plains of Mars during this update. A makeshift rocket suspended more than 10 stories above the Texas prairie is progressing through a step-by-step series of ground tests to prove that SpaceX's new Falcon 9 rocket is ready for launch next year. The 90-foot-long prototype rocket, called a run tank by SpaceX, simulates the mass and dimensions of the Falcon 9 rocket's first stage. 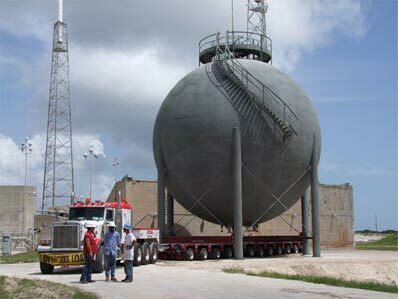 The run tank arrived more than a year ago at the SpaceX engine test site in McGregor, Texas. Large bolts and pins hold the run tank to a 135-foot-tall three-legged vertical test stand resembling an oversized tripod. The entire structure, including the rocket and the test stand, looms 235 feet above the Texas countryside. The stand is built to handle three times more thrust than the Falcon 9 produces. "It's just up there for us to test," said Lauren Dreyer, business development manager at the McGregor test site. "That vehicle will never fly." The run tank has already completed seven tests, including three 15-second firings of nine Merlin 1C engines attached to the bottom end of the white cylinder. Those tests occurred in late July, early August and late September. The nine engines produce about 832,000 pounds of thrust at sea level, about four times the power of a 747 jumbo jet at full throttle. The engines consume about 3,200 pounds of kerosene and liquid oxygen per second. The tests send a thunderous roar through McGregor, a Central Texas town of less than 5,000 people. SpaceX's team of 60 engineers and technicians in McGregor first tested the run tank with one engine late last year. Workers gradually added more engines during a series of tests this spring. The average SpaceX engineer in McGregor is less than 30 years old, not far off the company-wide number. "That means that they're able to work really long hours," Dreyer said. Some of the engine tests have run late into the night due to last-second aborts, but officials hope the aggressive test schedule will help work out kinks in the vehicle before the rocket arrives at the launch pad. Officials also plan a 30-second firing and a full duration first stage "mission duty cycle" test lasting about two minutes and 50 seconds. Then engineers will turn their attention to demonstrating various "engine out" abort modes to check the rocket's ability to recover from engine failures. The Falcon 9 is designed to accommodate engine failures during the first stage burn. The stage's nine engines provide enough oomph to still reach orbit if one engine fails early in ascent. The rocket could even steer through multiple engine failures later during the first stage burn, officials said. During normal launches, SpaceX expects to shut down the nine engines in a staggered sequence as the excess performance is no longer needed. SpaceX plans to hire at least 25 more employees at McGregor in the next six months. The 300-acre site will stay busy for the foreseeable future with qualification and acceptance testing once the Falcon 9 becomes operational. The company's expected flight rate would require engineers to churn out about 50 engines per year. "Whatever flies will have to come through Texas to be acceptance tested," Dreyer said. "Things will be faster and more furious than they are right now." Engineers in McGregor do structural checks on integrated Falcon rocket stages and test the company's stable of Merlin and Kestrel engines. SpaceX also built a hypergolic test stand for the Draco thrusters that will be used on the second stage of the Falcon 9 and the Dragon capsule, which is designed to ferry cargo to the international space station. SpaceX has invested about $10 million in the McGregor facility, which dates back to the 1942 establishment of a war munitions plant. A number of defense companies tested solid rocket motors at the site during the Cold War, according to Dreyer. The most recent tenant was Beal Aerospace, the start-up company founded a decade ago by a Texas banker with a vision to lower the cost of access to space. Beal used the facility for liquid-fueled rocket engine tests from 1997 until 2000, adding several buildings and constructing the tripod-like vertical test stand. Beal Aerospace abandoned the site when the company folded in late 2000. The facility sat unused until SpaceX took control in late 2002. SpaceX outfitted the facility for the company's own product line. SpaceX, short for Space Exploration Technologies Corp., was founded in 2002 and bankrolled by Elon Musk. Musk made his fortune through the development and sale of PayPal and Zip2. The company is already fabricating the first few Falcon 9 flight stages at their headquarters in Hawthorne, Calif.
Technicians have finished welding the two initial Falcon 9 first stages. One will be shipped to Texas for ground testing, and the other stage is tagged for the first launch next year. The first flight vehicle will be shipped to Cape Canaveral by the end of this year to begin several months of on-site checks before launch as early as next April. "We're on track to do that both from a launch site standpoint and from a vehicle standpoint," Musk said. That first launch, originally on the books as an unsigned demonstration flight, now has a paying customer. But SpaceX officials aren't disclosing the payload yet. "A lot of Falcon 9 contracts that there were in negotiations were predicated on just getting Falcon 1 to orbit," Musk said. The successful launch of SpaceX's smaller Falcon 1 booster in late September will allow the company to accelerate the final steps of Falcon 9 development, officials said. "We can now take some of that staff from Falcon 1 to focus on Falcon 9," said Diane Murphy, SpaceX's vice president of communications. Murphy said SpaceX already has a staff of more than 560 employees, and the company is continuing to hire more engineers. The Falcon 1 success, the first in four tries for the launcher, also gave engineers more confidence in the Falcon 9 system, Musk said. The Falcon 9 uses the same Merlin 1C engine as the Falcon 1 rocket. The vehicles also share similar software and guidance systems. "There are more engines, but it's the same fundamental engine," Musk said. Nine Merlin 1C engines will propel the Falcon 9's first stage. A single vacuum-rated Merlin 1C engine will power the rocket's second stage. The Falcon 9 is a key part of SpaceX's proposal to supply the international space station with cargo after the space shuttle is retired in 2010. 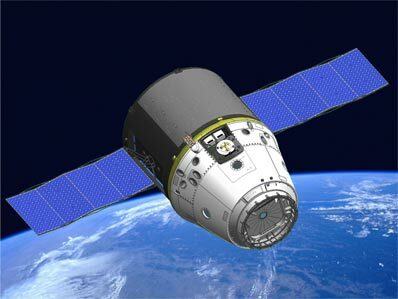 The heavy-lift rocket will haul the company's own Dragon spacecraft into orbit before docking to the complex. SpaceX and Orbital Sciences Corp. are vying for the job of delivering equipment and supplies to the station between 2010 and 2015, when NASA's Orion capsule is scheduled to debut. The Commercial Orbital Transportation Services, or COTS, program is aimed at cultivating a U.S. contractor for the missions, instead of relying on Russia, European and Japanese vehicles. Federal funding for the project is driven by schedule milestones in Falcon 9 and Dragon development. SpaceX has met 12 of 22 COTS milestones so far, and the next schedule objective will come in December with the critical design review for the second and third COTS demonstration missions. Those missions will launch in late 2009 and early 2010, if everything goes as planned. 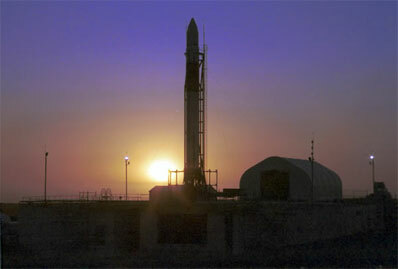 The first COTS test flight, a six-hour orbital mission, should blast off next June. The second flight will include a practice rendezvous. 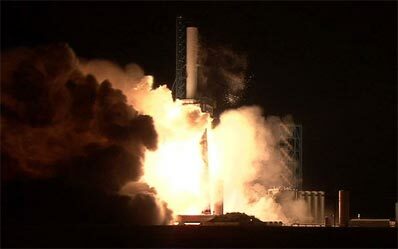 The third mission will be the "real deal," said Max Vozoff, SpaceX mission manager. SpaceX has seven Falcon 9 missions on the books through 2011, including government and commercial launches. Crews in Florida are busy readying Complex 40 to receive the Falcon 9. The storied pad, which was the East Coast home of the Titan 4 rocket, is undergoing a facelift that included the demolition of its old launch towers earlier this year. Large spherical tanks for the Falcon 9's liquid oxygen and kerosene propellants are now in place at Complex 40, Murphy said. Workers have completed pouring new concrete at the pad, and SpaceX has received all the necessary approvals from the Air Force to use the launch site, which lies on Air Force property. SpaceX will use a $200,000 grant from the State of Florida to tie Complex 40 into the Air Force helium pipeline that supplies other launch pads on the base, Murphy said. Workers are installing a system of high-definition and infrared television cameras around the pad. The Falcon 9 will also require a new data and communications network. Technicians are already testing that system, Murphy said. Crews are also constructing a large hangar about 500 feet from the pad. The structure will house the Falcon 9 as it is put together and tested horizontally before being rolled on rails to the pad and erected vertically. Before the maiden launch, SpaceX plans a string of pathfinder checks, countdown rehearsals and fueling tests. The preparations will culminate in a brief static test firing of the Falcon 9 first stage engines at Complex 40. "A static fire is kind of like doing a run-up on an airplane," Musk said. "You have the brakes held, you go to full throttle and then analyze the data afterwards to see if there was anything of concern." SpaceX engineers have used on-the-pad engine tests before each Falcon 1 launch attempt, but engineers expect to delete the exercise as missions become more routine, according to Musk. Officials eventually plan to roll out the rocket from the hangar and launch in less than one-and-a-half hours, but it may take several successful missions before that goal is reached. The highly automated process is modeled after the Zenit rocket, which achieved similar rollout-to-launch times for the Soviet Union during the Cold War, Musk said. The company is still working on securing a launch site for Falcon 9 launches headed to polar orbit. Missions originating from Cape Canaveral can only reach equatorial orbits around Earth. SpaceX is releasing its hold on Space Launch Complex 3-West at Vandenberg Air Force Base in California. Officials had hoped to use the retired pad for Falcon 1 launches, but squabbles with the Air Force over the site's proximity to other nearby operations caused the company to ditch those plans. Space Launch Complex 4 is now on SpaceX's shopping list at Vandenberg, according to Tim Buzza, the company's vice president of launch operations. Officials could also opt to launch the Falcon 9 to polar orbit from Kwajalein Atoll, where its Falcon 1 launch pad is located. But that would pose some serious logistics challenges. Launching from the continental United States is easier, Buzza said. 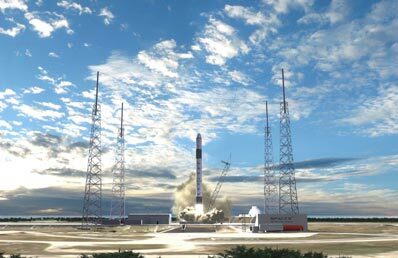 A polar orbit launch site would allow SpaceX to compete for most government launch contracts with United Launch Alliance Atlas and Delta rockets.